Apartments Dalila, in which we hope to welcome you, is without a doubt among the most beautiful and most exclusive accommodation capacities of Ulcinj’s Long beach (Velika plaža). Traditional hospitality of its staff, good conditions and nice accommodation are also good trumps on our side. The fact that we have quite a lot of guests who are returning with each new season clearly shows how carefully we take care about hospitality by which the whole region has been already recognized. They have seen what we can do and what we offer. The purpose is to leave a good impression, to offer comfortable accommodation and to have satisfied guest who would like to come again. The building adorns central part of Long beach (Velika plaža), the largest Adriatic beach that is usually compared to the magnificent sandy beaches of Brazil and Mexico. Certainly it is not coincidence that Long beach (Velika plaža), is a holder of blue flag for 10 years, of which seven continuously. With a distinctive beauty there is also very good infrastructure – settled swimming areas, sports fields for volleyball, beach umbrellas, beach deckchairs, notice boards, playgrounds for children, access paths, beach bars and toilets. The famous beaches Noki, Bonita and Copacabana are only 850 m far away from your future accommodation, approximately 15-minutes’ walk, or 5 minutes by car. There you can find free parking at any time of the day. Our successful tourism story dates back to 1986, with construction of the building by modern standards, renovated 13 years later. 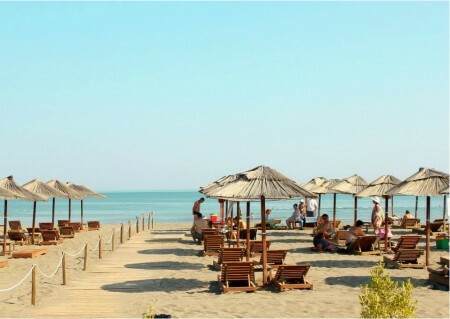 An additional enchantment to the villa gives vicinity of an ancient Ulcinj, which enables you to have a good fun and sightseeing of a large number of cultural and historical monuments, as well as Ada Bojana whose beauty will surprise you. Villa Dalila, with its comfort, luxurious equipment, courtesy and solicitude staff, gives all preconditions for an unforgettable vacation. Air-conditioned rooms with bathrooms, balconies and kitchens, equipped with cable TV and free wireless network, presents more than pleasant harbour of rare moments when you need to rest and sleep or still preparing for charms of Riviera. During that time, you do not worry about your car which is safely placed at our parking lot. Depending on your needs and desires, there are well supplied markets within 50 meters away, as well as several restaurants with local and international cuisine and very reasonable prices. Guaranteed peace and silence in a large courtyard with beautiful orchard, security, absolute privacy and comfort, provides ideal atmosphere for a family vacation to remember.